To get started with today’s topic, I got a question for you. What kind of person are you? Are you motivated? Are you lazy? Are you always running late? Are you a leader or a follower? Are you good at sports? And where did those beliefs come from? A former teacher, your friends who have labeled you a certain way, or maybe simply from yourself. We all have an image of the type of person we are. Some of these images are positive, but some are detrimental to moving forward and making positive changes. We use stories to understand the world, but sometimes we can make ourselves the villain without thinking twice about the consequences of that narrative. For example, if you think of yourself as a failure, you’ll quite likely fail. Conversely, if you consider yourself successful, you’ll find ways to succeed. If you think you’re bad at learning languages, well, you might subconsciously resist becoming a great English speaker. That’s dangerous. And that’s the basic idea from the book I recently read, how our self image dictates our behavior. 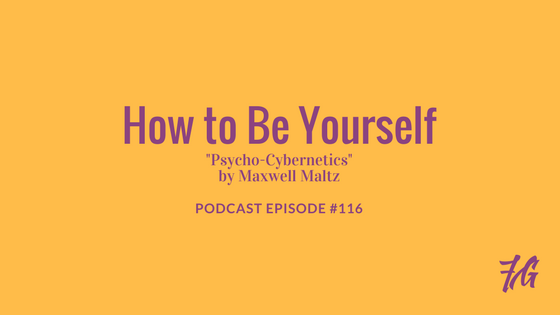 The book is called “Psycho-Cybernetics” by Maxwell Waltz. It was published in 1960, so it’s been around a few years, but the book is great. I read a lot, obviously, and i read a lot of regurgitated ideas. People take some basic self-help ideas and write their own book about them. Put their name on them. Nothing really special there. But this book, even though it’s from many decades ago, I found plenty of interesting ideas I hadn’t thought of or read about before.